Nordstrom Rack is holding its Clear the Rack event today through Monday. The sale offers up to 75% off clearance items including clothing, shoes and accessories. Featured brands include Hugo Boss, Lucky Brand, Free People, Diane von Furstenberg and more. Free shipping is available on orders over $100. 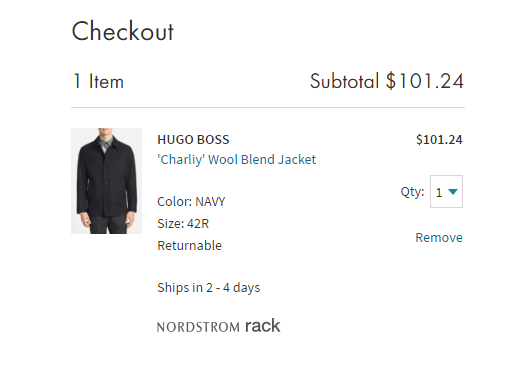 Get ready for the changing weather with the Hugo Boss Wool Blend Jacket available for $101 (Reg. $445), 77% off the original price. Perfect for any upcoming holiday parties or fall weddings is the 70% off Diane von Fursetnberg Lace Sheath Dress available for $105 (Reg. $348). Also available is the versatile 77% off Free People Tunic Dress for $33 (Reg. $148). Check out our Fashion Guide for even more Columbus Day clothing sales.